MARGAO: Several BJP ward level leaders who unsuccessfully contested municipal elections on the BJP-backed panel, on Saturday joined Goa Forward along with hundreds of their supporters. 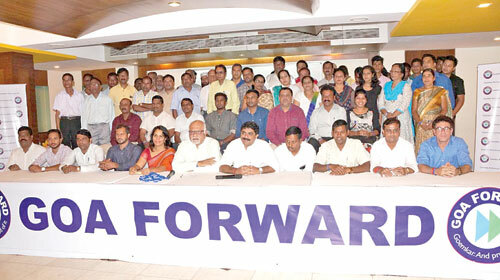 Those who joined Goa Forward had together polled around 3000 votes in the municipal elections. Addressing the media at Margao, Fatorda MLA and Goa Forward mentor Vijai Sardesai along with party President Prabhakar Timble, Margao Municipal Council Chairperson Babita Angle Prabhudesai and all the Fatorda Forward councillors welcomed the new entrants. Those who joined the party include Sujay Lotlikar, ex-councillor Raju Naik, ex-councillor Ramdas Hazare, Charlton Baretto, Vitorino Tavares, Custodio Dias, Mayur Naik and Florindo Miranda. Sujay Lotlikar had contested in Ward No 5 and polled 705 votes as against the 726 polled by the sitting councillor Peter Fernandes. Lotlikar said that BJP Fatorda Mandal was hijacked by a single individual and all local leaders were disrespected by this individual. Former councillor Ramdas Hazare said that the local high command and youth leadership of Goa Forward makes it the best option. Ex-councilor Raju Naik who had polled 735 votes in Ward No 11 in a direct two-way fight against sitting councilor Angelis Pereira who had polled 833 votes said that he is determined to stay with Vijai Sardesai and Goa Forward Party or is ready to quit politics. Custodio Dias appreciated Sardesai who got elected four ST candidates in Fatorda when only two seats were reserved for the ST community in the Margao municipal elections. He said the Goa Forward Party is the only future for the ST community in Goa. Prabhakar Timble, welcoming the political workers of Fatorda, said that Goa Forward is a movement providing opportunities for Goans to be political and social leaders. He said, “Unless we make people of Goa the High Command, we will fail to preserve Goemkarponn.” He assured that the goldsmith community of Goa will be duly represented on the State Executive of the GF party through Sujay Lotlikar.